The Lisi laboratory utilizes solution NMR methods along with techniques in biochemistry, biophysics, and molecular biology to interrogate changes in protein structure and conformational motions that underlie function. We are especially focused on enzyme complexes, aiming to understand how biological events such as protein-protein interaction or the binding of allosteric effectors and drug-like molecules modulate functionally relevant protein motions, intra- and intermolecular signaling, and/or catalytic reactivity. There are several projects underway in the laboratory. We are particularly interested in determining the roles of two signaling proteins, macrophage migration inhibitory factor (MIF) and granulocyte-macrophage colony-stimulating factor (GM-CSF), in inflammatory responses connected to asthma, acute respiratory distress syndrome, and arthritis. Our investigations probe changes in the three-dimensional structures and multi-timescale conformational dynamics of these proteins, leveraging various biochemical stimuli (i.e. cellular redox conditions) to detect signatures of disease-related states. We aim for structural insight that will generate translational impact with potential for development of novel therapeutic approaches to inflammatory diseases. Molecular motions are critical to the optimization of enzyme scaffolds, occurring on timescales ranging from picoseconds-to-seconds that are often commensurate with steps of the catalytic cycle. 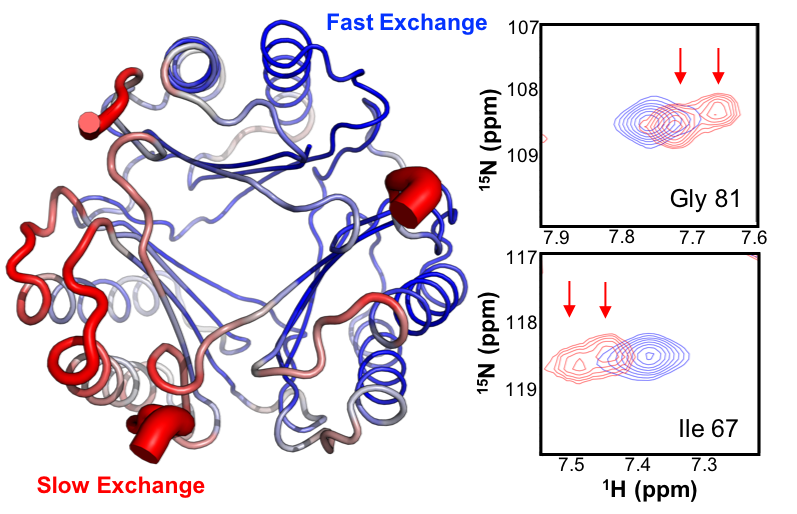 These local fluctuations are known to propagate biological signals throughout the protein matrix, allowing enzyme complexes to synchronize the function of multiple domains. We aim to characterize these dynamic pathways so that we can a) pinpoint the chemical and biological activators of catalysis and b) identify points of functional control beyond the active site. These approaches are useful in elucidating chemical mechanisms and developing targeting strategies for disease-related enzymes. 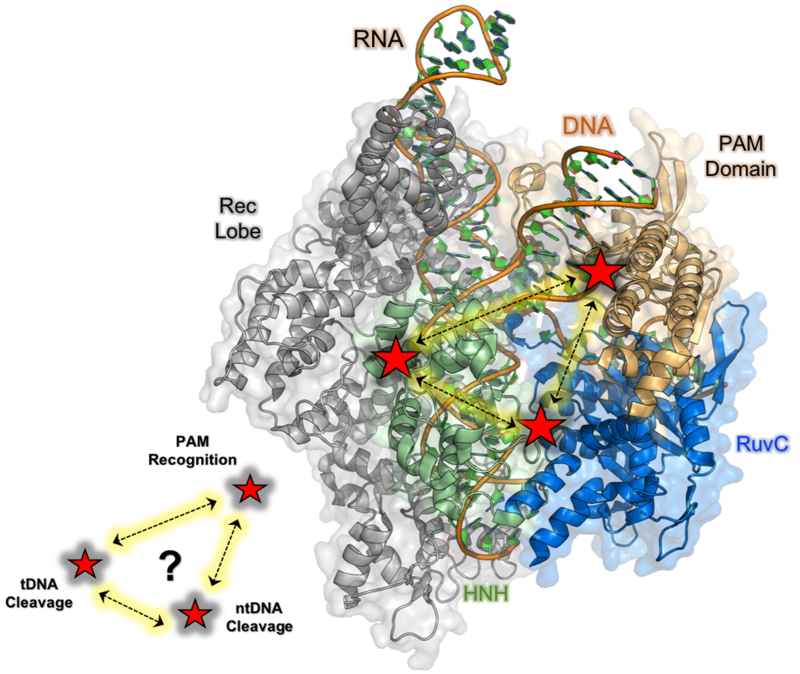 Our current work on the 1,350+ residue CRISPR-Cas9 endonuclease machinery aims to provide atomistic insight into the role of multi-timescale protein dynamics in transmitting biological (allosteric) information over large molecular distances to coordinate DNA cleavage. We investigate changes in the global structure and intrinsic dynamics of Cas9 subdomains in the presence of both its guide RNA and DNA substrate, allowing us to piece together the allosteric network of interactions that govern its function. Insight from our NMR studies are coupled to the state-of-the-art computational work of our collaborators (Victor Batista, Yale; Giulia Palermo, UC Riverside) that help to define the biochemical crosstalk controlling precise DNA cleavage. Insight from this work has potential to enhance spatial and temporal control over CRISPR-Cas9, which can improve its genome editing capabilities. The ability to exert functional control over an enzyme from a region that is spatially distinct from its active site is a biological approach that is becoming popular in drug discovery. Allosteric phenomena are widely acknowledged in biochemistry, but it remains unclear exactly how or why allostery manifests itself in enzymes. The expansive and complex nature of protein structures suggest that an overwhelming percentage of allosteric regulatory sites remain undiscovered. We are interested in exploring unifying (structural and dynamic) principles of allostery that can facilitate the identification of these sites a priori and elucidate new biomedically relevant molecular mechanisms. We are currently using a family of bacterial enzymes, phosphoribosyl anthranilate isomerases (PRAIs), that catalyze the same chemical reaction despite significant structural, oligomeric, and mechanistic diversity, as a model to understand the biochemical and biophysical features most critical to allostery.